1. The House of Commons Environment Food and Rural Affairs (EFRA) Committee has invited written evidence on the subject of air quality prior to holding an oral evidence session. Clean Air in London (CAL) is pleased to respond to this call for evidence. Two further articles are expected shortly to address indoor air quality and the Olympics. 4. CAL has attached an Appendix with detail on ‘Solutions’ and two Case Studies on ‘Smog alerts’ and the ‘Olympic and Paralympic Route Network and related transport arrangements’. 5. Ambient or outdoor air pollution comprises particles and gases. The particles, which can comprise anything from tiny droplets to diesel soot and tyre and brake wear, are called ‘particulate matter’ and classified by their aerodynamic diameter in microns (one-millionth of a metre (mm) which is about one-hundredth of the thickness of a human hair) e.g. PM2.5 and PM10. The gases, which can coalesce and become particles, are mainly nitrogen dioxide (NO2), ozone (O3) and sulphur dioxide (SO2). 6. In the Great Smog of December 1952 there were 4,075 deaths in London due to short-term exposure to visible air pollution with more over the following months. Mayor Johnson was the first politician to use advice from the Committee on the Medical Effects of Air Pollution (COMEAP) in 2009 to publish in June 2010 estimates by ward of 4,267 deaths in London in 2008 attributable to long-term exposure to invisible PM2.5. 7. It is fair to point out there were as many early deaths in London in 2008 attributable to long-term exposure to PM2.5 as we thought occurred during the Great Smog of 1952 (due to short-term exposure to air pollution when we knew nothing of the long-term effects). On a like-for-like basis, only smoking causes more early deaths. COMEAP has speculated that air pollution may make some contribution to the earlier deaths of all those dying from cardiovascular causes e.g. heart attacks and strokes. It seems Ministers and the Mayor: do not understand the seriousness of this public health crisis; or do understand it but have chosen to downplay the issue to avoid accountability and action. 8. A more detailed explanation can be seen in the Politics Home article on Health. 9. CAL’s analysis of the latest data from the European Environment Agency confirms that London had the highest levels of NO2, a toxic gas, of any capital city in Europe in 2010. Concentrations of PM10 are much higher in Beijing than London but levels of NO2 are comparable in the two cities. 10. Analysis by the Environmental Research Group at King’s College London has shown: little or no change in NO2 concentrations in London in the last 10 years; and small reductions in PM10 concentrations between 2008 and 2010 that have since reversed. Reductions in PM10 concentrations are likely to have been achieved as a result of the implementation of Ken Livingstone’s low emission zone (LEZ) in stages from 2008 and favourable weather conditions. 11. The Mayor’s Air Quality Strategy in 2010 estimated road transport is the main source of PM2.5 emissions in London, contributing around 80% in 2008. For emissions of NOx (i.e. not concentrations of NO2), Boris Johnson estimates road transport and domestic gas (e.g. from cooking and heating) contributed 46% and 22% respectively in 2008. 12. Transboundary air pollution can be a problem particularly when wind speeds are low. That is one reason why the PM10 daily limit value allows 35 exceedances in a year (of a daily mean of 50 micrograms per cubic metre (mg/m3)) whereas the WHO guideline is to have none. Given the prevailing winds, it is likely that London and the UK export more transboundary air pollution to continental Europe than they receive. Berlin estimates its own contribution to PM10 [emissions] has reduced by one-third since 2006. As far as CAL is aware, no comparable estimates are available for London. 14. A more detailed explanation can be seen in the Politics Home article on Sources. 16. See a more detailed analysis in the Appendix and the Politics Home article on Solutions. 17. Air quality laws are breached every day by a factor or two or more along London’s busiest roads (and elsewhere). No other public health or environmental standard is breached on such a large scale with such serious consequences for public health. 18. CAL has therefore lodged a formal complaint with the European Commission about the UK’s failure to comply with air quality laws. ‘Part one’ of the Complaint is that: the UK obtained unlawfully a time extension to comply with the daily limit value for PM10 in London; and, without prejudice to that part of the Complaint, even if a time extension is sustained for the PM10 daily limit value, it was breached in Neasden Lane, London (again) in 2011. ‘Part two’ of the Complaint is that: the UK breached the annual mean and hourly limit values for NO2 in London and 16 other zones in 2010 (and 2011); and has not applied for a time extension for those zones (i.e. it submitted: plans for 23 zones in September 2011 under Article 22 of Directive 2008/50/EC on ambient air quality and cleaner air for Europe; and plans for London and 16 other zones under Article 23). A response to CAL’s compliant is expected shortly. In summary, together with other correspondence, CAL has discovered that Defra has: produced no new plans to comply with NO2 limit values; undertaken no equalities assessment; and holds no information relating to inequalities and NO2. 21. A report for Defra titled ‘Air Quality and Social Deprivation in the UK: an environmental inequalities analysis’ (Interim Report 2 to Defra under Task 3 of Contract RMP/2035) dated June 2005 showed that 18.8% of the most deprived decile of the population experienced the highest 10% of NO2 concentrations compared to 2.8% of the least deprived decile (Table 5.1 on page 20). 22. The Court of Appeal ruled on 30 May 2012 that the UK’s breaches of air quality laws are a matter for the European Commission. ClientEarth’s case against the Government in the High Court in December 2011 forced Defra to admit that it has breached NO2 limit values. These legal standards which align closely with World Health Organisation guidelines have been in legislation since 1999 to be complied with by January 2010. The Coalition Agreement stated “We will work towards full compliance with European Air Quality standards” (page 17). 24. Defra blames the failure of Euro engine emission standards for diesel vehicles for the UK’s non-compliance with air quality laws. However, the current and previous Government encouraged the increase in market share of diesel cars and vans from around 10% to over 50% (including after problems caused by diesel vehicles became well known). 25. CAL has urged the European Commission to launch infraction action against the UK before the Olympics for breaching the PM10 daily limit value and the NO2 annual mean and hourly limit values in London including along the ORN in earlier years. London and the UK should be leading the world in tackling air pollution as it did after the Great Smog of 1952. 26. CAL’s model for reducing air pollution is a ‘seesaw’. On left of the fulcrum we need to: increase (i.e. increase upward pressure) public understanding of the dangers of air pollution with advice for people on protecting themselves and reducing pollution for themselves and others; and reduce measures or action (i.e. reduce downward pressure) that inhibit such understanding e.g. the use of pollution suppressants in front of the air quality monitors most-used to warn the public of smog episodes and the failure to issue smog alerts. On the right of the fulcrum we need to: reduce air pollution at its source (i.e. increase downward pressure) e.g. introduce a network of inner low emission zones in cities; and reduce negative policies (i.e. reduce upward pressure) e.g. the use of biomass burning in cities. 27. Air pollution needs to be reduced at its source. ‘Offsetting’ is not a sustainable solution as it fails to tackle the underlying problem and sooner or later brings problems of its own (e.g. using pollution suppressants or planting trees). In assessing solutions, CAL advocates ‘The London Principle’ which is to accept a 1% increase in CO2 to achieve a 10% reduction in harmful emissions (and vice versa) provided legal limits are met. CAL also advocates a simultaneous focus on short-term abatement solutions and long-term ultra or zero low emission solutions rather than short and medium term ‘hybrid’ solutions which fail to address short-term health and legal challenges and undermine and delay the long-term solutions e.g. London needs to retrofit existing buses not buy hybrids (unless retrofit is impossible). 28. Boris Johnson included no new policies to tackle air pollution in his Mayoral manifesto. Worse, he showed a lack of understanding of the issue by portraying the 100% discount to the Congestion Charge for Euro 5 (diesel) vehicles with CO2 emissions of less than 99g/km as an air quality measure when it is not i.e. CO2 in ambient air is not harmful to health. With no new policies, Boris Johnson was given a negative score in a ranking of the Mayoral candidates because he was caught actively suppressing public awareness of air pollution and campaigning with the Government to weaken UK and international air quality laws. viii. Working against public understanding of the issue e.g. using ‘dust’ to describe dangerous airborne particles; a refusal to issue smog alerts even which pollution levels could cause problems for healthy people (who are unlikely to be aware of the issue); and messaging that misleads the public by highlighting reductions in pollution but not the sharp increase in understood health impacts e.g. research showing living or going to school within 150 metres of roads carrying over 10,000 vehicles per day could be responsible for 15-30% of all new cases of asthma in children and chronic obstructive pulmonary disease in adults 65 years of age and older. vi. Policies to reduce sharply diesel emissions which are 21 times higher for PM10 than petrol for saloon cars e.g. point of sale information. The International Agency for Research on Cancer, part of the WHO, classifies diesel engine exhaust as “probably carcinogenic to humans”. Vehicle manufacturers should be required to offer diesel particulate filter retrofit for their existing diesel vehicle stock. There should be mandatory regular testing of off-road vehicles. 32. In CAL’s view, the issuing of smog alerts when air pollution of any sort is likely to be MODERATE on two or more days or HIGH or VERY HIGH on one or more days is the most obvious first step to building public understanding of the dangers of air pollution. Such alerts can include advice for people on protecting themselves and reducing air pollution for themselves and others. 36. On 27 February 2012, the Environmental Audit Committee published the Government’s response to its further inquiry into air quality which stated “The Government strongly supports and welcomes campaigns to improve understanding of the public health impact of air pollution at local level and agrees that better public awareness is vital.” (paragraph 57). Speaking to AirQualityNews, a spokeswoman for Defra said that as yet only moderate levels of ozone had been recorded across the capital by the government and any high ozone readings would be publicised immediately. 41. CAL considers it very odd that Defra says ‘better public awareness is vital’ but then chooses not to issue press releases during smog episodes when health advice may avoid premature cardiovascular mortality. It seems it’s the ‘wrong sort of air pollution’ or the ‘wrong sort of monitoring network’ for issuing press releases. To compound the problem, the Mayor of London says it is the Government’s responsibility to issue smog alerts, not him. 42. Policy 12 of the Mayor’s Air Quality Strategy titled ‘Raising public awareness of air quality issues’ states “The Mayor will encourage individuals to take action to improve air quality and will encourage the provision of targeted information about air quality to people most at risk from the health effects of air pollution”. “We want to keep improving air quality and reduce the impact it can have on human health and the environment. 44. In CAL’s opinion, the Government is consistently failing to warn the public or ‘covering-up’ the biggest public health risk after smoking. 45. We were promised the ‘greenest Games ever’. 47. When asked at the Transport Committee “Will the transport arrangements lead to breaches of air quality law?”, the Secretary of State for Transport said “The short answer is no”. When pressed, she went on to say that “The overall assessment was that those differences were not material enough to change the decision” and hopefully they would be “few and far between”. 48. 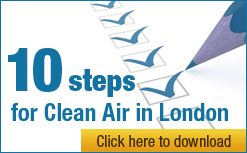 CAL’s solicitors have written to Transport for London (TfL) saying we remain concerned that “the approach taken by TfL to assessing and mitigating the air quality impacts of the ORN/PRN will fail to protect the health of Londoners and is unlawful and fails to meet the obligations of the Air Quality Standards Regulations 2010”. 51. In previous Games, odd and even number plate bans or the ‘Big Scare’ tactic have been used to achieve the 30% reductions in background traffic needed to ensure the smooth operation of the ORN/PRN. Mayor Johnson has opted for hundreds and perhaps thousands of local traffic restrictions and uncertainty instead of adopting the Berlin-type LEZ that CAL has advocated for the past four years to give certainty and ensure a legacy from the Games. The latest advice for drivers is to avoid central London, the ORN and Olympic venues unless travel is essential. TfL plans to use the Pollution Suppressor to mitigate PM10 impacts. The final result for air pollution is likely to depend on the weather. 53. These scientists were reported as saying that if we have still hot days, long distance athletes, like marathon runners and cyclists who breathe very hard, could feel a tightness in their chest or experience ‘coughs, breathlessness or other problems’. Those with asthma may need medication. Athletic performance could be affected. 54. This section highlights the legal requirements to ensure: the PM10 daily and annual mean limit values are not exceeded in London (or elsewhere) in 2012 (e.g. no more than 35 ‘Bad Air Days’ when 35 have been reported already along the ORN at Upper Thames Street); the NO2 hourly and annual mean limit values are not to be exceeded where they have previously been attained (e.g. in nearby roads); and NO2 levels are not worsened by the Olympic Transport Plan and/or ORN where levels of air pollution are currently breaching legal limits (e.g. along much of the ORN in central London). 55. Most important to understand is that air pollution limits are absolute and apply everywhere (more or less) i.e. air pollution cannot be ignored on the grounds of materiality or its local or temporary nature.